M. A. Sumanthiran, Member of Parliament (TNA) speaks in Parliament, highlighting the need for the government to take honest steps to protect journalists and ensure media freedom. Sumanthiran says that the manner in which the government fails to take steps to investigate and arrest those causing violent physical attacks on media institutions, clearly points to the conclusion that it is carried out by agents of the government. He cites as an example, the way in which the “Uthayan” newspaper has been attacked. Uthayan is the only regional Tamil newspaper in Jaffna. He accuses the government of sending ‘military goons’ to attack the Uthayan newspaper. The fact that such physical attacks are accompanied or followed up by vilification/slander campaigns by state controlled media such as the Daily News is even more unacceptable, adds Sumanthiran. He blasts certain statements made by Major General Hathurusinghe against ‘Uthayan” as most inappropriate, and draws to the attention of the House that this is an individual who has been named by the Leader of the Opposition (not once but several times) for running private militias in Jaffna. 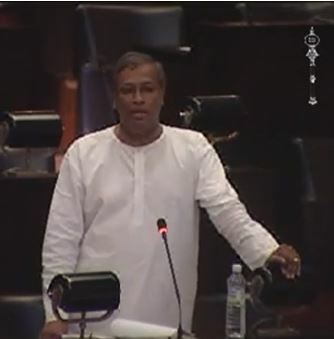 Sumanthiran strongly condemns what he describes as ‘hate speech by the government .. backed up by actual physical attacks’ and says the government MPs have no shame, and all they can do is shout and make a noise. He throws a challenge to the Media Minister to properly reply to his charge that the government is acting improperly in relation to media freedom and abusing state media day after day. He urges the government to take genuine steps to vindicate acts of violence against media and makes the point that this failure has resulted in Sri Lanka being noted internationally as a place in which safety of journalists are in danger. The Colombo Telegraph which is run from outside Sri Lanka is able to publish the full speech, which has not been published to date by the media physically based in Sri Lanka. This man is a rising STAR in the very dark and black skies over Sri Lanka. His legal and human rights background could make him our savior but Sri Lankans are too deaf, dumb and blind to acknowledge someone who could be an agent of change, regardless of ethnicity. Hope he does not turn out to be another MR one time human right champion. There are comments here making Sumanthiran the main opposition candidate. Good but will it work. For argument sake, forget about the UNP Sinhala voters, Muslim voters or the general Tamil voters. Do you all think the other Tamil MPs will vote for him. No way except Sampanthan. Do not you all know that Sumanthiran’s biggest enemies are his TNA colleagues. This is politics, dirty politics. Let us not forget how Jaffna man thinks in promoting another Tamil. Good comment. I know Sumanthiran is doing his best staying focused on larger issues of fairness and rule of law which I think everyone wants. He is doing his part by being an advocate for these higher values. The question is what can be done to put him in the best position to get Sri Lanka out of the darkness and back to being a democracy instead of a clan run country. This man may be Tamil, but I think he has broad appeal because he rises above ethnicity or religion. He lives in a world where there is right and wrong and where there are universal values that apply to everyone of all races and ethnicity. I understand that people don’t like the TNA, but they could at least acknowledge that Sumanthiran is the best not only in the TNA, but in the nation. I think if the TNA is his springboard for now then that should be fine until his base gets even broader. He has a lot of grass roots appeal, but the question is how he can capitalize that to get in a position to make a positive difference in everyone’s lives. Sri Lankans are lucky to have someone like this that they can take pride in. They deserve a real statesman. Instead of looking at people like Sajin Vaas in the opposite side, look at your own back yard. MPs like Maavai Senathirajah, Suresh Premanchndran, Sri Tharan, that Shabra finance company fame guy and few others must be removed from the front line of Tamil politics. Then and then only, more and more Sumanthirans will enter Tamil politics. Let us do that first. Then let us elect successful professionals enter politics. Not career failed lawyers like that Batti MP (I do not know his name even) become our representative. There are many who would like to come to the front line but people do not want to elect them. This is the problem with the people’s rule. Hats of to MP Sumanthiran he hit the nail right into the Govt heads the entire CT comments hailed this man except for one or two black sheeps like leela actually he is a man called Harold Leelaratna I notice many addressing him as a she. Azwer is a shameless man always came to Parliament on national ticket, UNP & SLFP took him for his interrupting tactics (only qualification)in parliament where others cant, he dont have & electorate nor done any community work, enjoys perks & Govt salary as MP & Advisor to president, just a zero. Bravo nice speech Sumanthiran in parliament, parallel to JVP singhala speeches you ignored the other atrocity of the Army & other security apparatus of the state . The two political activists of FLSP called Lalith & Kugan abduction in Jaffna Tar bashing of the Womens wing leader Dimmuthu Attygalle also their abductions in Colombo with her colleague Kumar Gunarathnam, repeated harassment to their paper Janarala similar to Uthayan, the 2 killing of students wing march from Kandy to Colombo, much appreciated if these also enters the Hansard book I know youre time was limited anyway good luck try next time.